Bernadette Blackstock, a member of the Glassboro Rotary Club and a principal in the People for People organization, is being honored Tuesday, Oct. 7, as one of 10 Rotary Women of Action at the White House. 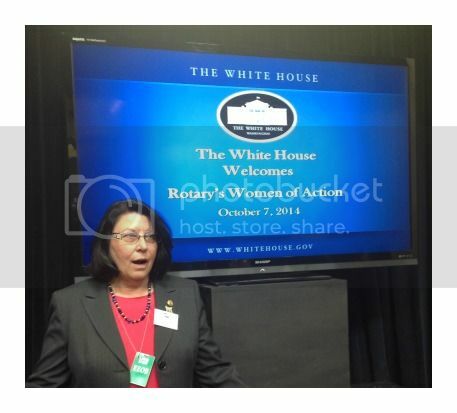 Blackstock, honored for her “exemplary dedication to improving the lives of others,” according to Rotary statement, is one of a select group of women from across America recognized at the White House for donating their time, talents and expertise to help thousands of people in need. The invitation to the White House is part of the annual Rotary Day in Washington, D.C. The event features high-level administration speakers and a look at the lasting improvements the 10 women have brought about in the lives and communities they serve. Blackstock was recognized, not only for her years of leadership service to South Jersey Rotary District 7640, but for her years of community service. She is founder, president and CEO of the People for People Foundation, heads up the Pascale Sykes initiative, The Heart of Gloucester County and is on the executive board of the South West Long Term Recovery Group for Superstorm Sandy. She has also served in leadership positions with the Gloucester County Habitat for Humanity, the 4-H Fair Association, Senior Corp and others. Blackstock has received several awards from elected officials and the community, and was a recipient of the Greater Woodbury Chamber of Commerce Founders Cup, received the Presidential Call to Action Lifetime Achievement Award and the Gloucester County Chamber of Commerce Business Person of the Year award. She also has a long history of service to veterans and is the co-founder, with her husband, Paul, of the annual Gloucester County Veterans Picnic, which just celebrated its 30th year. She also founded the Gloucester County Wreaths of Remembrance program and is a certified Veteran Service Officer.